If you’re looking for something to do that isn’t linked to the Christmas holidays, consider attending a theater production. An excellent choice can be found right here in Chester County. Now through December 30, The Resident Theatre Company (RTC) is presenting “Lend Me A Tenor” at Uptown! Knauer Performing Arts Center (236 North High Street, West Chester,http://www.rtcwc.org). “Lend Me A Tenor” is a comedy by Ken Ludwig. The play was produced on both London’s West End (1986) and New York’s Broadway (1989). It received nine Tony Award nominations and won for Best Actor (Philip Bosco) and Best Director (Jerry Zaks). A Broadway revival opened in 2010. “Lend Me a Tenor” has been translated into 16 languages and produced in 25 countries. The title is a pun on “Lend me a tenner” (i.e., a ten-dollar bill). The story takes place in Cleveland Ohio in 1934, on a very important night for the Cleveland Grand Opera Company. Tito Mirelli, the world-famous Italian tenor, is set to perform the starring role in Othello. The company’s general manager is worried about everything turning out right, and insists that his assistant, Max watch over Mirelli’s every move to make sure that he shows up at the theater on time. The general manager isn’t the only one afflicted with a case of nerves. Max is also a nervous person — a nervous, young man with a secret talent. Max’s task proves to be harder than anyone could have imagined. Throw in his fiery Italian wife, an ambitious female co-star, Max’s giddy girlfriend, a flirty board member of the opera guild, and a meddling bellhop fighting for Mirelli’s attention and the stage is set for comedic disaster. Broadway veteran Bart Shatto is starring as Tito Mirrelli. Shatto’s played the iconic role of Jean Valjean in “Les Miserables” on Broadway. Shatto, who was born and raised in Illinois, attended college at Western Illinois University and Southern Illinois University. “I was born in Peoria, Illinois, and majored in broadcasting at school,” said Shatto, during a recent phone interview. Instead of pursuing a career in front of a broadcasting microphone, Shatto opted for the microphone of a live concert and the microphone of an actor in a stage musical. Shatto has performed at renowned regional theaters including Actors Theatre of Louisville, Alley Theatre in Houston, Ford’s Theatre and the Barter Theatre. Shatto also had the distinguished honor of performing for President Bush at the National Theatre in Washington D.C. along with Maya Angelou, Hal Holbrook and Tricia Yearwood. You might have seen Shatto perform on stage even if you’ve never seen a musical production in a theater. As a singer, Shatto has been a member of the Gold/Platinum-selling symphonic progressive rock band Trans-Siberian Orchestra (TSO) for almost two decades. He is known for singing the live concert version of the song “Old City Bar” (dressed as a homeless man) from the “Christmas Eve and Other Stories” album – an album that is the ninth best-selling Christmas album in the United States. Laurie Wells of Broadway’s “MAMMA MIA!” plays the role of Maria, Mirelli’s wife. Other key cast members are Michael Yeshion as Saunders, Woody White as Max, Hillary Wilson as Maggie, Angel Sigala as The Bellhop, Katie Horner as Diana, and Trina Tjersland as Julia. Resident Theatre Company’s Producing Artistic Director Kristin McLaughlin Mitchell is directing this production – a show with which she is very familiar. She teamed with Stanley Tucci to direct the Broadway revival of “Lend Me A Tenor” in 2010. Tickets for “Lend Me a Tenor,” which runs through December 30, range from $25-$53. 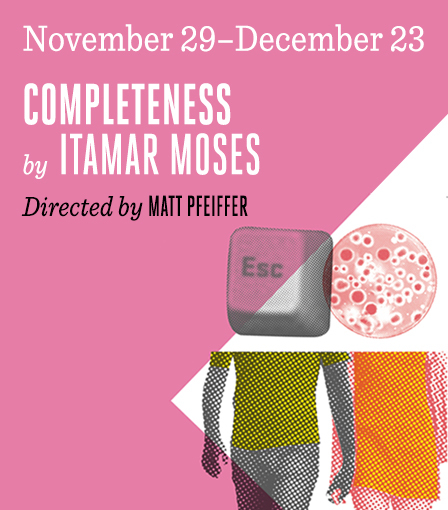 Another excellent choice would be “Completeness,” a new play by 2018 Tony Award-winner Itamar Moses that is opening the 2018/2019 season of Theatre Exile (www.theatreexile.org). The show is running now through December 23 at The Louis Bluver Theatre at The Drake, which is located at 302 South Hicks Street in Philadelphia. The focus of the story is — how does a computer scientist hook up with a molecular biologist? Using a formula that parallels the message in a song by Thomas Dolby from the 80s, he blinds her with science. When Elliot builds a computer program to help Molly with her research project, the variables in their evolving relationship shift as rapidly as the terms of their experiment. This deft and imaginative new ROM-comedy shows that even the most sophisticated algorithm may freeze in the face of life’s infinite possibilities. “The first origin for ‘Completeness’ was when I was in college 20 years ago,” said Moses, during a recent phone interview from his home in New York. “I was a humanities major and had to take a couple science courses. One of the science courses was Electrical Engineering 101. In that class, they dealt with the Traveling Salesman Problem – exponentially increasing the complexity of simple problems and making them unsolvable. “Later, I had Traveling Salesman Problem in my head. I figured it was a metaphor, but I didn’t know what for. I received a Sloane Commission from Manhattan Theatre Club – a theater about math and science. “If you have a commission from them, they mandate that you write about match and science. Luckily, I already had this idea that I had been thinking about for years. “Completeness” was originally commissioned by the Manhattan Theatre Club. The play was first presented by South Coast Repertory in Costa Mesa, California, on April 17, 2011. The play was first presented Off Broadway by Playwrights Horizons in New York City on August 19, 2011. Both productions were directed by Pam MacKinnon. Since then it has been produced at Theater Wit in Chicago in 2013, VS. Theatre Company in Los Angeles in 2014, and Normal Ave in New York, New York in 2018. Even though “Completeness” had regional and New York premieres, Moses continued to tinker with the script. According to Moses, “I think there’s a common misconception that when a play premieres, or premieres in New York, that the playwright is necessarily done with it. Sometimes that’s true, but it’s just as often not true, there are usually at least some things that nag at you, that you never felt you got completely right. “Sometimes you let it go, chalk it up to experience, and vow to get it right on the next play. But sometimes one of those nagging feelings is so strong that you keep thinking about the play and the work you want to do on it. That’s what happened to me with ‘Completeness.’ Finally, about four years after the New York premiere, while watching a small production in L.A., which was directed by Matt Pfeiffer, I had the light bulb moment and saw how to fix the things that had been nagging at me. Moses earned his bachelor’s degree at Yale University, and his Master of Fine Arts degree in dramatic writing from New York University. He has taught playwriting at both Yale and New York University. His most prominent work, the musical “The Band’s Visit,” opened on December 8, 2016 at the Atlantic Theater Company. That production won the 2017 Obie Award for Musical Theatre Off-Broadway. After closing on January 9, 2017, the musical moved to Broadway and officially opened on November 9, 2017 at the Ethel Barrymore Theatre. For his work on “The Band’s Visit,” Moses won the 2018 Tony Award for Best Book of a Musical. “The story of Elliott and Moly is set in an unnamed graduate school more or less in the present,” said Moses, who has written for TNT’s Men of a Certain Age, HBO’s Boardwalk Empire, WGN’s Outsiders, SHOWTIME’s The Affair, and TNT’s The Alienist. The Traveling Salesman Problem was mathematically formulated in the 1800s by the Irish mathematician W.R. Hamilton and by the British mathematician Thomas Kirkman. Video link for “Completeness” — https://youtu.be/rrYhDgMAdF4. The show at Theatre Exile will have performances through December 23. Tickets are $40. Rainbow Comedy Playhouse (3065 Lincoln Highway East, Paradise, 800-292-4301, http://www.rainbowcomedy.com) is presenting “Christmas in Paradise” now through December 29. The production is a Rainbow original – and the theater’s most loved Christmas story. A Lancaster County Amish family shares the true meaning of Christmas with some big city visitors who have lost their way. It is a story that will warm your heart and make you laugh. Matinee performances are every Wednesday, Thursday and selected Saturdays with an 11 a.m. lunch and a 1 p.m. curtain. Evening performances are every Friday, Saturday and selected Thursdays with dinner at 6 p.m. and the show following at 8 p.m. There will also be “Twilight Performances” on selected Sundays with dinner at 2:30 p.m. and the show at 4 p.m. Ticket prices range from $27-$63. 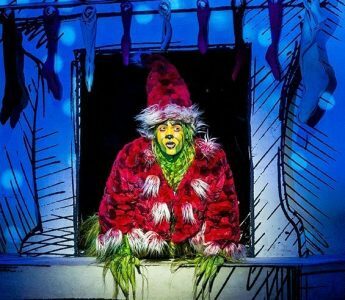 If you want a theater performance that is linked to the Christmas holidays, the Grinch has just what you need. “How the Grinch Stole Christmas!” is a Dr. Suess children’s story written in rhymed verse with illustrations by the author. “Dr. Seuss’ How The Grinch Stole Christmas! The Musical” features the hit songs “You’re A Mean One Mr. Grinch” and “Welcome Christmas” from the original animated series. Max the Dog narrates as the mean and scheming Grinch, whose heart is “two sizes too small,” decides to steal Christmas away from the Holiday loving Whos. This year’s production, which is running now through December 31 at the Academy of Music (Broad and Locust streets, Philadelphia, 215-893-1999, www.paballet.org), is the 50th annual staging of the classic ballet. The ballet is based on E.T.A. Hoffman’s tale “The Nutcracker and The Mouse King” and set to a score by Peter Ilych Tchaikovsky. Featuring lively dances, colorful costumes and elaborate sets, “The Nutcracker” is a production that appeals to audiences of all ages. The original version of the timeless classic was first presented in Saint Petersburg, Russia in 1892. Balanchine’s choreography plays a major role in the Pennsylvania Ballet’s annual production of “The Nutcracker.” The company has been doing both acts by Balanchine for more than three decades. George Balanchine, who was named Giorgi Balanchivadze when he was born in Russia in 1904, was one of the last century’s most celebrated choreographers. He was a primary developer of ballet in the United States in his position as co-founder and ballet master of New York City Ballet. Balanchine created his version of “The Nutcracker” for the New York City Ballet in 1955. The Pennsylvania Ballet’s production of the ballet features over 100 performers and has an annual audience attendance of over 50,000. The company’s production is big, colorful and elaborate. And, it is staged in one of the most beautiful performance halls in the country. The version of “The Nutcracker” performed by the Pennsylvania Ballet features everything audiences associate with the timeless ballet—a cast of 19th-century families celebrating Christmas Eve, a little girl’s dream of her Nutcracker Prince, the Prince’s toy soldiers battling a fleet of mice led by the Mouse King and the crowd-pleasing second act of dances in the land of the Sugar Plum Fairy. Video link for Pennsylvania Ballet’s “George Balanchine’s The Nutcracker” – https://youtu.be/2cUP07px8-Q. Evening, matinee, and morning performances are scheduled now through December 31. Ticket prices range from $35 -$164. 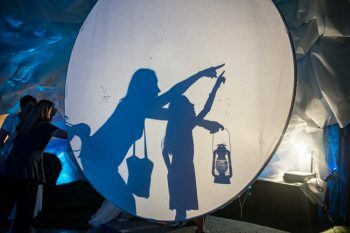 There is another interesting attraction currently running in Philadelphia that is a “theatrical production” – sort of. It’s called “Holiday Figmago” and it’s running now through December 29 at Meg Saligman Studio (825 Bainbridge Street, Philadelphia, www.MegSaligman.com). “Figmago” was conceived by Philadelphia muralist Meg Saligman and Brian Sanders, the founder of local contemporary dance troupe “BRIAN SANDERS’ JUNK. Meg Saligman Studio is an award-winning public art studio based in Philadelphia. The studio is known for creating international landmarks, including many of the world’s largest painted murals. The studio has been recognized by the New York Times, the Wall Street Journal, NPR, the National Endowment for the Arts, Art in America, the Smithsonian Institute, and numerous others. Studio founder Meg Saligman was named one of the most influential American muralists by Public Art Review, and many of her seminal murals are located within short distance of her studio. “BRIAN SANDERS’ JUNK” is a nationally-recognized troupe performing domestically, internationally and regularly in Philadelphia and the surrounding area. Sanders continues to create evening length works and a consortium of repertoire on JUNK. His site-specific shows sell out every year for the Philadelphia FringeArts Festival. The name “Figmago” and the concept of the show came from mashing together the phrase “figment of the imagination” with “imago,” which is the term for the final stage of a caterpillar’s life when it emerges from its cocoon as a butterfly. In this self-guided installation, a work of art becomes a world of art through secret passageways, 3D murals, and hands-on exploration. For the 2018 Holiday Season, you can check out “Holiday Figmago,” an artist’s winter wonderland. You can have the opportunity to catch some silver bells and explore mesmerizing murals. You’ll be able to become the subject of a life-sized vintage holiday card, get lost in nostalgia with Christmas classics, and even see Santa checking over his list of who’s naughty or nice. “There are seven rooms, and each is decorated for Christmas,” said Alicki. “Each is different and unique with a lot to look at. One of the rooms in interactive where you can dress up and take photos. “Holiday Figmago” is running now through December 29 from 11 a.m.-5:30 p.m. each day. Tickets are $10 for adults, $8 for students and children (ages 4-15) and free for children (three and under).